Teaching a dog to walk on a leash is not a hard thing to master and can be accomplished by a variety of techniques. There are also as many tools for walking a dog as there are ways to teach this particular dog behavior. Are you leash training a puppy? 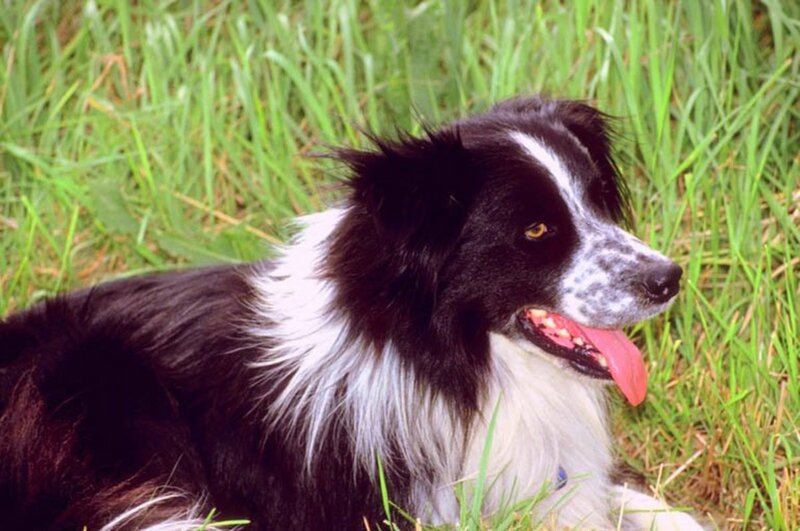 Does your dog's breed play a role in your training to walk on leash? Do you have a rescued dog you are trying to train to walk on lead? Is your dog older and never been taught to walk calmly on a leash? 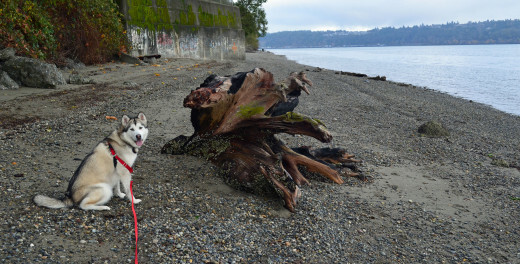 What do you plan to do with your dog on leash? Hike or run? Or just walk? Do you feel confident training your dog to walk on leash? Is your dog horrible at straining towards people and other dogs when walking? All of these questions (and maybe several more) play a part in deciding which technique might be best for your dog and you. The answers may also have an effect on where you train your dog. For instance, well behaved dogs are usually a better bet for formal classes while out of control dogs might need individual work or even the help of a professional trainer. Whatever method you choose though, remember to be consistent but also keep an open mind and you will have success with leash training! The most important thing of course is that you have a collar and a leash. Many people use a variety of collars and swear by them. More on that below. Some even use a harness. Whatever seems to work best for you and your dog is what you should use. Basic leash training involves a few simple things--like getting your dog (no matter what age) used to a collar. In order to walk on a leash, the dog has to be comfortable with the collar. After getting your dog used to a collar, proceed to adding the leash. Most dogs don't take to leash training right off. For some reason, it makes them feel restricted and like they've lost a bit of their freedom! Ah--the purpose! Whether you're dealing with a puppy or an older dog who has had no leash training, the practices are basically the same though with a puppy very short sessions repeated throughout the day work much better than long sessions because they have no attention span. Treats can be a very valuable asset. If the dog seems reluctant to walk at all on the leash, go out in front of the dog, kneel down and call the dog to you. Reward with a small treat or piece of kibble. Practice this until the dog feels comfortable walking with the leash on. Next, progress to walking with a piece of kibble or treat in your closed hand. I use my left hand since that's the side I want my dog to walk on. This effectively gets their attention and encourages them to stay close to you. Don't treat all the time--bad habit! Treat every so often and when they least expect it but there is NO limit on praise! Tell them over and over what a good dog they are for walking right by you. Move from kibble or tiny treat in your hand to in your pocket. Yep--they know it's there but they never know when they'll get it so it's a good training tool. I even put doggie waste bags in my pocket and crinkle them every now and again while I'm walking since my malamutes are easily distracted by many things and tend to forget what the rules are regarding walking by my side. Over time, you can train your dog to walk neatly beside you (a true heel position) or you can let them venture out ahead of you with the caveat that if you give them a command or a gesture, they will come back to your side. This is especially effective for approaching people or dogs off leash. You can also work with any number of types of leashes from retractable leashes to very long leashes to harnesses. For problem dogs, leashes that fit over the head can be effective while for others, the Haltie may be the answer. The Gentle Leader is shown below on my young mal Gabby and we had very little success with it while the Haltie (shown further down on the shore) is the perfect solution for her particular quirks when walking. For really hard to train breeds or dogs who do not seem to be responding to any other method, the E-collar can help you train the dog in the beginning realizing that this is merely a training tool and not to be used all the time. One important thing to remember is that the presence of a leash can cause anxiety in any dog. It's said that more dog fights happen on leash than off and from my own experience, this has some merit. My dogs do seem to tense and act differently when on leash compared when they are off leash. However, for their protection and mine, I never let mine off leash except at home or in a secure fenced environment. It's crucial to try to be relaxed when doing anything with your dog on a leash. Another truism is that they do sense tension and it travels right down the leash. If you are worried about an oncoming dog that is roaring towards you, your dog is going to sense your panic and probably react more urgently. Like an umbilical cord, a leash connects you to your dog so keep a cool head and always act as an alpha would in the situation. Take charge and chances are, your dog will follow suit and not feel he or she needs to step up and be the alpha. This author has great experience with malamutes. They can be one of the most remarkable breeds to work with and conversely, they can be one of the most frustrating. They are all unique and you can never plan on the response being the same from one to another. My youngest malamute, Gabby, was a joy to train. She was energetic, happy-go-lucky and so much fun it was a breeze as a puppy. However, as she aged just a year or so, she began to develop the malamute tune-out behavior. People who have mals know the look and the attitude...as if to say "Eh? No speaka Ing-glais, mamasita." After being this wonderful puppy I could walk anywhere, she suddenly at 1-1/2 turned into what I affectionately call "my little pony." It is if you're walking a horse not yet gentled as she rears up and prances about like a wild horse. Back to the drawing board I went. This technique has worked (thus far) along with a special harness called the Haltie in curbing her horrible leash behaviors. Wait until the dog finally comes back to your side before moving on--but at the moment that the dog comes to your side, praise lavishly and/or offer a small treat--and move on! This technique is extremely tedious for the owner as I can attest but it does work--especially if you repeat it for say a week. Usually the dog will tire of getting all revved up to walk and then being made to just wait and will quickly put the pieces together and figure out why. This author has been deadset against prong collars for as long as I can remember. However, I have come to the realization that with malamutes, sometimes it's important to be flexible. Choke chains have their place in training. 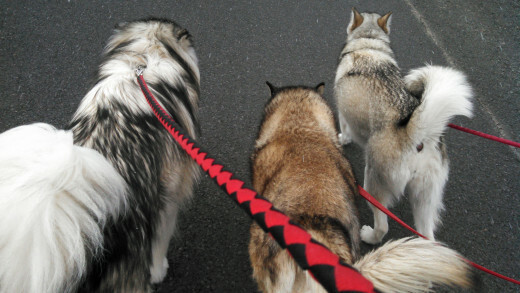 Unfortunately with malamutes or other dogs who are accustomed to pulling with the entire upper part of their body, choke chains may do more harm than good. Remember that what works with one dog may never work with another. Choke chains on my wooly Griffin were a joke as he couldn't feel them through all that fur. The prong collar quickly got his attention--however, it is never used as more than a quick jerk and release. It's only there to remind him that I'm in charge and he needs to listen as in "now." He is so well trained that I seldom have to even exert so much as a partial jerk as he is listening to my commands more than responding to the collar. 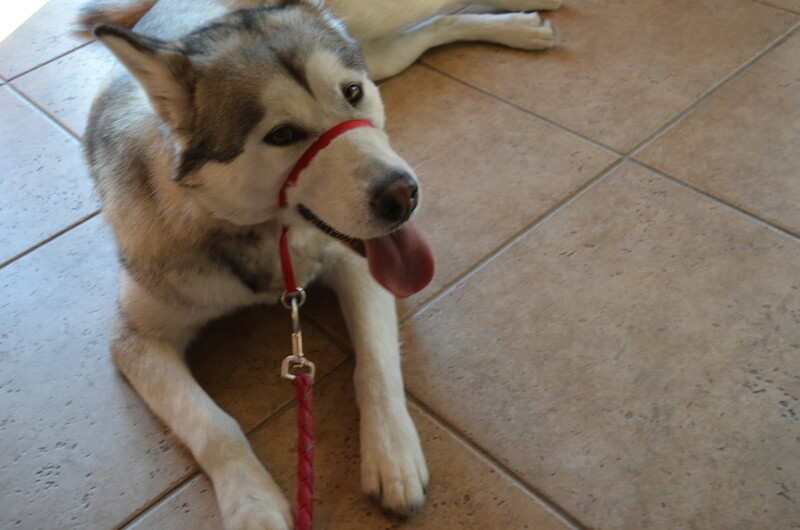 On the other hand, pinch collars have no effect whatsoever on my other malamute Gabby who I mentioned above. She would break her larynx before she would stop pulling on it so it became a very bad alternative to the plain choke collar. The collar should fit properly and again, be used as an adjunct to getting your dog to pay attention to you--not as a means to control your dog. Even the strongest person will not be able to contain a dog bent on going after another dog or leaping at passersby if the dog is not trained properly on leash in the first place. Even with the prong or pinch collar, the leash should be lax and the dog should be relaxed. If not, more training is required. Prongs are used mostly with large dogs who have a propensity to strive for control of the situation. 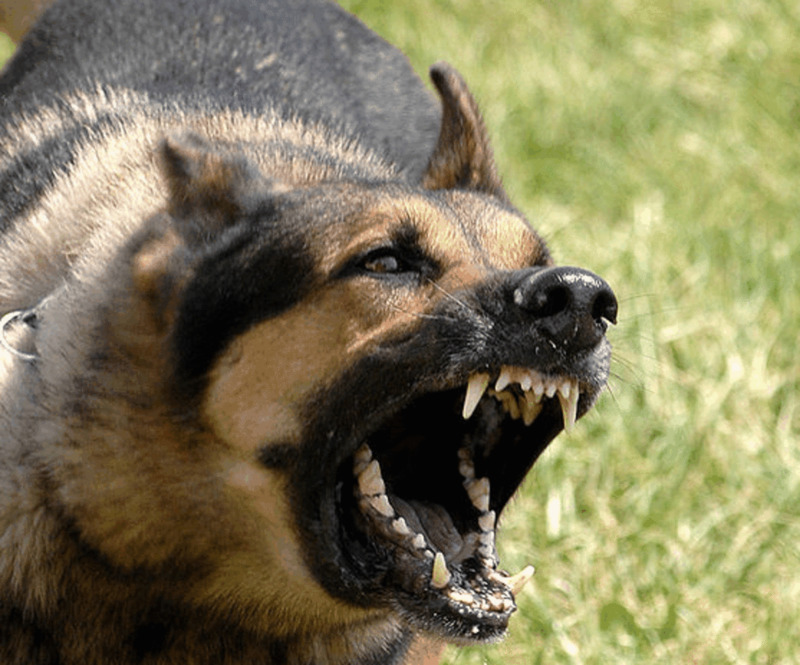 They should only be used as a means to get your dog's attention and will not solve problems with dogs who want to be alpha or who have aggression problems. Again, this author is not fond of this device and never have been. However, I have employed one for a very short period of training when both our younger malamutes were bent on defying our commands and were persistent in trying to drag us down the street. This was usually towards someone or some other dog, which is not acceptable. It's imperative that anyone using a shock collar or an electronic collar purchase it with the video and instruction manual and actually review both to learn how to use it properly. If you do not use it properly when leash training your dog or begin training him or her in any way with it on, you can bet you will have a problem with your dog you will need to fix. These devices when not used properly can scare your dog if the current is turned up too high. They can make your dog so fearful that he or she will not respond at all. That is not the goal. As with a choke collar or a prong collar, the idea of the E-collar is to get your dog's attention especially if you are dealing with a particularly stubborn or cantankerous dog. In our case, we only had to use the electronic collar for a couple of training sessions. After that, we simply put the collar on and they were immediately responsive to our every command--without us ever pushing the button. We rewarded them for their good behavior and then were able to take the collars off and they still obeyed us. Because of the size of my dogs and our age, we do use the prong collar or the Haltie just to give us the extra confidence of control if we are out in public with our dogs. In this case, it's more a protection for those around us "just in case." We find that usually our dogs were faced with something that has nothing to do with them. We can be walking quietly through a park and be faced with dogs off leash running at us or kids on skateboards and bikes zooming past us. This is an exercise in my firmest canine belief--my dogs should be controlled by me and not the situation. Sometimes you have to employ tools to help you if you happen to have very big dogs or dogs who have a tendency to test the limits occasionally. I believe that the reason my dogs respond to us is because they trust us to be in charge. For my stubborn little malamute Gabby, we have found the Haltie to be the best solution for a dog who would be a pony on leash. While some show that the Haltie is an over-the-head kind of leash, our is a harness that fastens with the leash in the front of her chest. While she resisted the leash that fit over her head and pulled her head back, she doesn't seem to have too much trouble with this type of Haltie. This in effect makes them unable to exert enough force (which malamutes definitely have) to pull you forward continuously. In my observances of her coming towards me, it appears to hobble her gait a bit as she strains to get her way with pulling. She eventually relaxes and walks (gasp) like a normal dog but even with this type of harness/leash, we have to build in 5-10 minutes of trying to do it "her" way while she settles in for the duration. Never realized, Audrey, all the tips and tricks for properly leash training large dogs like your beautiful but very strong Mals. Probably because I always owned very small dogs who I was stronger than. Maybe not smarter, but definitely stronger. Thank you for this complete encyclopedia of proper leash training facts, m'dear. Thanks Eddy as always--enjoy your day as well. Ubaidh: Thanks for dropping by--it is a science indeed trying to train dogs but in my case a little more complex as mals happen to be one of the most intelligent breeds out there--and the most stubborn~! So very interesting and useful;great tips and easy to follow. One to vote up,across and sare.